Midwestern summer storms are notorious for their ferocity. They dump heavy rain or hail on everything in their path, moving on as swiftly as they roll in. However, simulating the turbulence of these convective storms, including intense updrafts and high rain rates, has long been a gray area for climate models. Motivated by recent model resolution improvements, Pacific Northwest National Laboratory scientists conducted climate simulations at several model resolutions over the lower 48 United States. Their model realistically simulated summer precipitation when its grid size was reduced to 4 by 4 kilometers (about 2.5 by 2.5 miles), well below a 100 km grid size. Scientists also found that realistic simulations could occur with larger grid sizes using convection formulations that are less sensitive to grid sizes. These two approaches hold promise for improving current and future simulations of precipitation. Why It Matters: The Earth's water cycle supports life and activities we might take for granted, such as swimming in the river on a hot day or enjoying a bountiful winter snowpack. Gathering more accurate information about rain and snow through better precipitation simulations will help people answer questions about how crops will grow or whether reservoirs will be full in the future. Limitations in computing speed and capacity, as well as model representations of convection, have created a "gray zone" in resolution for modeling convection and precipitation around the globe. In the gray zone, traditional convective parameterizations (simplified formulas representing complex processes) are not valid by convection is not yet explicitly resolved. With recent advances in computing, scientists are helping to bridge the gray zone. They can simulate the climate over smaller and smaller grid sizes. Meanwhile, the search for better convection representations—some of the toughest to do—has led modelers to "scale-aware" approaches applicable across a wide range of grid sizes. The scientists in this study showed that modeling at 4 km grid spacing to explicitly resolve convection or representing convection using scale-aware representations produces skillful precipitation simulations. The research will help reveal more strategies to advance Earth system modeling. Methods: PNNL scientists evaluated the effects of model resolution and convective representations across gray zone resolutions (approximately between 4 km and 15 km). 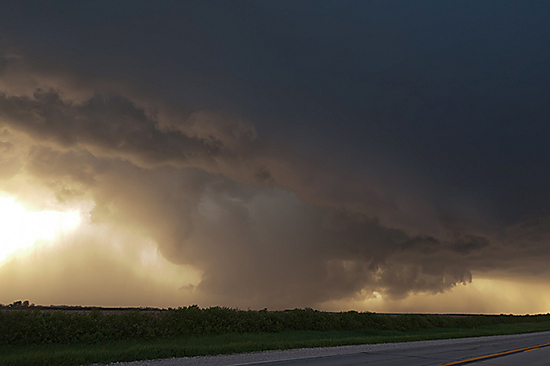 Researchers conducted simulations using the Weather Research and Forecasting model at resolutions of 36 km, 12 km, and 4 km for two summers over the contiguous 48 states. How the precipitation cycle varies during the day over the Great Plains, with the length/color and direction of the arrows indicating the magnitude of maximum precipitation in mm/day and timing of precipitation maximum in local standard time, respectively. The middle and bottom panels show more realistic simulations at 4 km resolution and using the scale-aware Grell-Freitas (GF) scheme. The convection-permitting simulations at 4 km grid spacing proved to be most capable in reproducing the location and intensity of precipitation and its sub-daily variability—during the times of day when different areas experience rain; e.g., one area might get it only at night and another mostly during the afternoon. Researchers analyzed notable differences between simulations with the traditional and scale-aware convection formulations. 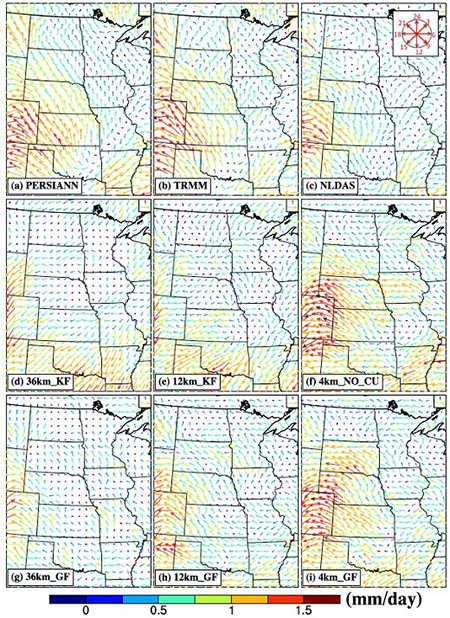 Combining convection-permitting modeling and scale-aware physical representations less sensitive to resolution improved simulations of the nocturnal timing of precipitation in the Great Plains and North American monsoon regions. Their design showed the scale-aware representation is less sensitive to model resolution compared with the traditional method. 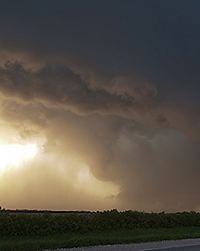 Researchers also performed analyses to understand the commonly found warm bias—an offset from observations that leans toward warmer temperatures—in the Southern Great Plains. Overall, the research demonstrated notable improvements in simulating summer rainfall and its sub-daily variability. These resources will lead to better simulation of the water cycle process in models that simulate the Earth system. What's Next: Convection strongly interacts with large-scale atmospheric circulations. Researchers will evaluate convection-permitting modeling and scale-aware representations in a global variable-resolution modeling framework to improve convection simulation and its feedbacks on large-scale circulation. This is important for understanding how warming may affect convection and associated extreme precipitation. Sponsor: The Department of Energy's Office of Science, Biological and Environmental Research supported this research as part of the Regional and Global Climate Modeling program for the Water Cycle and Climate Extremes Modeling (WACCEM) Scientific Focus Area. User Facility: Computational resources from the National Energy Research Scientific Computing Center (NERSC), a DOE Office of Science user facility. PNNL's Institutional Computing program provided additional computational resources. In one sentence: PNNL researchers showed that modeling at 4-kilometer grid spacing or using scale-aware representations produces skillful precipitation simulations.